For us, last year finished on a high, so we welcomed in 2017 with excitement about the year ahead and all we plan to achieve in the next 12 months. It is our mission to continue to build on the momentum and success we enjoyed in 2016, and make this year even better than the last. The first few weeks of January have been pretty busy as we gear up to open two new stores, but it isn’t just business as usual at Sim Trava – we’re making this year all about trying new experiences… That is, just last week and for the first time ever, we opened our doors to a group from outside the business to attend a coffee-making masterclass! The masterclass was a prize we offered at a local school’s fundraising event and was auctioned off to the highest bidder in attendance – one of the school mums. The winner was allowed to invite up to 7 of their friends to join them at the session which we held at our HQ last week. We had our coffee aficionados, Brad and Jarrod, leading the masterclass, who were on-hand to welcome our guests on the night and give them a comprehensive overview of the craft, and art form, that is coffee-making. 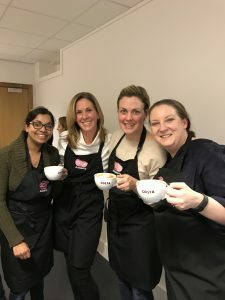 And, while we all know that a perfectly crafted cup of coffee takes practice and precision – a skill that is taught and honed over time – the masterclass was a good opportunity for coffee-making novices to get a deeper understanding of the roots of coffee, learn a bit more about the beans they love to drink, and to have a go at making their favourite drinks. 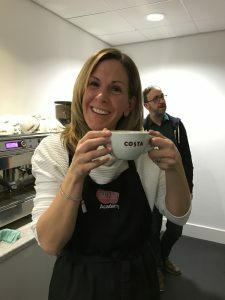 The two-hour masterclass had a packed agenda – starting off with an understanding of what coffee is and about its history, before moving onto the art of espresso; understanding how it looks, smell and tastes. Did you know, coffee was discovered in 850AD by an Ethiopian goat herder. Then we had a chemistry lesson – teaching our attendees on the science of milk and the different techniques of heating it. We finished the session with a tasting session of three of our most popular drinks; cappuccino, latte and hot chocolate – it went down a treat. 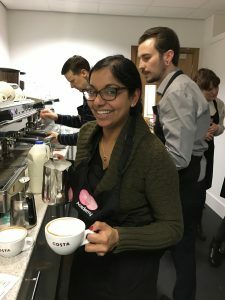 The masterclass was a success – everyone had a lot of fun, and walked away from the experience with a deeper appreciation having learned a lot more about the art that is coffee-making. Everyone had the chance to get on the coffee machines and try their hands at creating their favourite drinks. The experience was a great opportunity for us to give something back to the community and to give coffee-lovers the chance to learn something new about the stuff that powers their day. And, who knows – there might be another masterclass just around the corner…!